Presidential Adviser on the Peace Process Secretary Jesus Dureza on Monday rallied peace advocates to work even harder to achieve genuine peace and development “now that a milestone has been achieved” following the enactment of the Bangsamoro Organic Law (BOL). 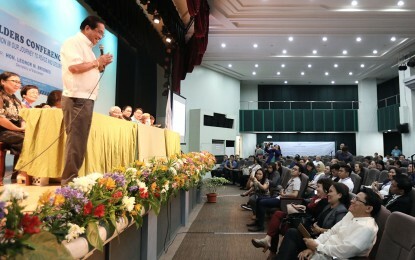 “Now we have reached milestone but it has still to be worked out,” Dureza said in his speech during the 1st United Nations Association of the Philippines (UNAP) Stakeholders Conference at the University of Makati, Makati City. Dureza said the crafting of the BOL was one of the major steps that President Rodrigo Duterte wanted to achieve to address the so-called historical injustice that the Bangsamoro people have experienced in Mindanao. “We cannot address peace with Bangsamoro if we will not address historical injustice that the Moro long to address,” he said. He said the Duterte administration wanted to make sure that improvement of people’s lives should be sustained along with genuine peace in the region. “We cannot achieve peace if we don’t improve the lives of the people. It must simultaneously come together,” he said. In line with the UNAP confab’s theme, “The role of Education in Our Journey to Peace and Security”, Dureza emphasized the need to improve the climate for education in the Bangsamoro area. “The truth is because there are so many children who are uneducated, many of them had already adopted violent extremism. They thought there is no way to improve their society. They’re giving up on it,” Dureza said. “But education will be very important tool in trying to change the outlook of the people. The children must be given the opportunity of having a perspective,” he added. Dureza expressed hope that the BOL would finally lead to a peaceful and progressive Mindanao, calling on the Bangsamoro people to unite to make their region a better to place for everyone. “Whether it will work or not, will really depend now amongst them already. I trust that this mechanism will bring about a better Bangsamoro area,” he said. He said the Bangsamoro leaders must address the breakaway groups like the Abu Sayyaf and the Bangsamoro Islamic Freedom Fighters by convincing them to help in bringing peace and development in Mindanao. “It is now left in the hands of Bangsamoro on how to make their area a better place for everyone. They have to chart their own future. They have already the mechanism. They have a big block grant of I think PHP50 billion every year from national government,” Dureza said. Dureza said the government will also continue to talk peace with the Communist Party of the Philippines (CPP). “Right now, the President has declared na kansel muna ang talks. Remember kansel muna. It means not totally cancelled (Right now, the President has temporarily cancelled the talks. Remembers, it’s temporary, not totally),” he said. He exhorted the UNAP stakeholders to keep on working with the government to bring about genuine peace throughout the country. “Our association (UNAP) would be a very big help in our work forward. As I said a milestone has been reached but still a lot to do. We need your support, assistance, knowledge and continued faith that we can work together on this,” Dureza said. The UNAP was established in 1947 to help promote global understanding, cooperation and peace in the Philippines and among nations based on human dignity and universal service. The association is an affiliate of the World Federation of United Nations Associations.